Crazy Friday over here (more on that tomorrow) so I’ll keep it short and sweet! Wearing one of my favorite color combinations… camel & navy… in an outfit that’s perfect for the summer-to-fall transition. I’m definitely not ready to put away my white jeans anytime soon so pairing them with seasonally appropriate pieces in navy and camel shades feels just right. You look lovely! I have posted a white jean outfit today! Beautiful outfit you look so stylish! I like your scarf and bag very much! Love those shoes and that jacket! Cute look! This outfit is so well put together! And those jeans look like they fit you perfectly! That blazer is adorable! What fabric is that? It looks leather from the photo! Beautiful summer/fall transition outfit. Blazer, shoes, scarf and purse very nicely put together to create this look. Love this color combo! I will definitely try doing this with pieces form my wardrobe. You look so lovely!! That scarf is so amazing. Great combination of colors. Love this look! beautiful! love it so much! so elegant and classic!really love the bag! 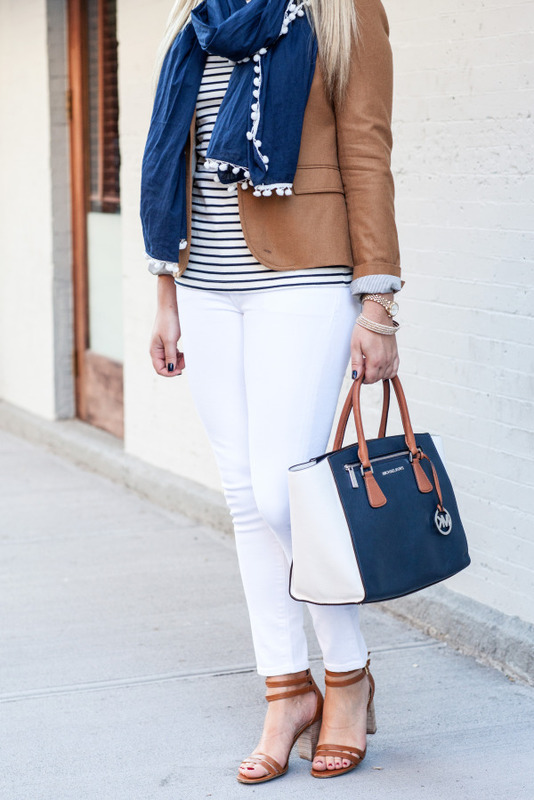 I love the blazer, navy and camel is such a beautiful pairing!